Typewriter. Acer charges just under 330 Euros (~$357) for the Extensa. You will get a quiet 15.6-inch Braswell notebook with a surprisingly good keyboard. The Extensa belongs to the low-priced notebooks in 15.6-inch format. Currently, the device costs just under 330 Euros (~$357). The computer is not unknown to us. 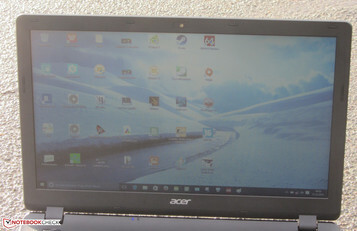 Several months ago we reviewed the Acer Aspire ES1-512-P1SM sibling with the same design. The Extensa has many competitors, since almost all manufacturers have low-priced notebooks in their portfolio. There are for example the HP 250/255, the Lenovo IdeaPad 100-15, the Lenovo IdeaPad 305-15, and the Toshiba Satellite C50D-B. In addition, Chromebooks like the Acer Chromebook 15 are also rivals. Since the Extensa and the Aspire ES1-512-P1SM use the same design, we will not cover case, connectivity, input devices and speakers in detail here. Information about these are available in our review of the Aspire. If you want to replace the integrated HDD with an SSD, you will have to open the case completely. This is done easily: Once you have removed all the screws from the underside, you have to turn the top side up again and remove the top side of the base unit with a putty knife. Take care: the top shell is connected to the motherboard with two ribbon cables, which have to be carefully disconnected. The incorporated memory card reader is rather slow. It achieves a maximum transfer rate of only 29.9 MB/s when copying big data blocks. It transfers 250 jpg files (about 5 MB each) at 11.8 MB/s. Thus, the memory card reader is one of the slower models. We use a reference SD card (Toshiba Exceria Pro SDXC 64 GB UHS-II) to test card readers. 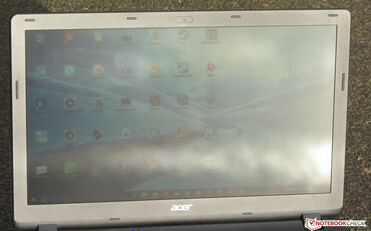 Acer has equipped the Extensa with a matte 15.6-inch display with a native resolution of 1366x768 pixels. Brightness (230.9 cd/m²) and contrast (388:1) are very low. However, these values are acceptable in view of the computer's price range. PWM flickering exists up to brightness levels of 90%. However, the frequency (990 Hz) is very high. Thus, even sensitive people should not have problems with their eyes. 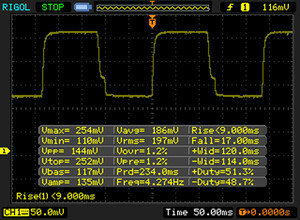 The display backlight flickers at 990 Hz (Likely utilizing PWM) Flickering detected at a brightness setting of 90 % and below. 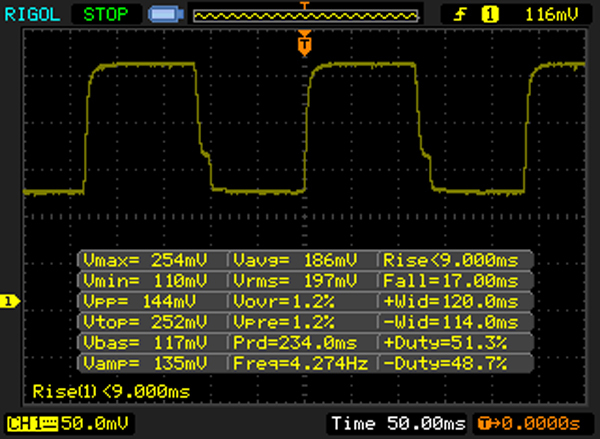 There should be no flickering or PWM above this brightness setting. 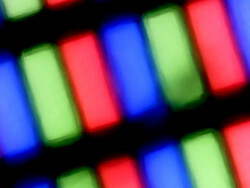 The display shows a DeltaE 2000 color deviation of 11.18 out-of-the-box, which is usual in the budget segment. A value smaller than 3 would be ideal. In addition, the display is very bluish. Acer has equipped the Extensa with a TN display. Thus, you cannot read the display from all angles. The device can be used outdoors if the sun shine is not too bright. In the Extensa, you will get a simple 15.6-inch office notebook. The integrated processor is suitable for simple office and internet applications. Our test model costs about 330 Euros (~$357). At the time of writing, we could also find two other configurations. The cheapest model, the Extensa 2519-C6N uses the same components as our test model, but it comes without a Windows operating system for about 270 Euros (~$292). Other configurations can be found among the Aspire ES1-512 series with the same design. With the Celeron N3050 (Braswell) dual core processor, the Extensa uses a weak CPU. Its performance is sufficient for office and Internet applications. For any higher requirements, you should consider a different notebook. The processor clocks at up to 2.16 GHz. The performance gain compared to its Bay Trail predecessor (Celeron N2815) is small (a few percent). This was to be expected since the architectures differ only marginally. The Braswell processor works at full speed in both mains and battery operation. The Extensa will not break any performance records. Nevertheless, the system runs smoothly and flawlessly. The results in the PCMark 8 benchmarks correspond to the integrated SoC. It performs significantly worse than Core i notebooks. 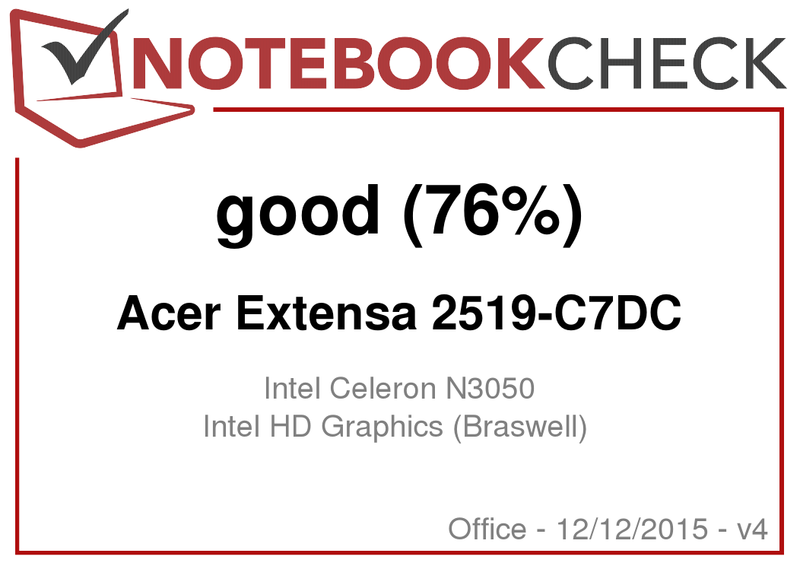 The Extensa performs better than comparably Bay Trail notebooks, since the GPUs of the Braswell generations are significantly faster than their predecessors. It is possible to increase the system performance of the Extensa by replacing the hard drive with an SSD. 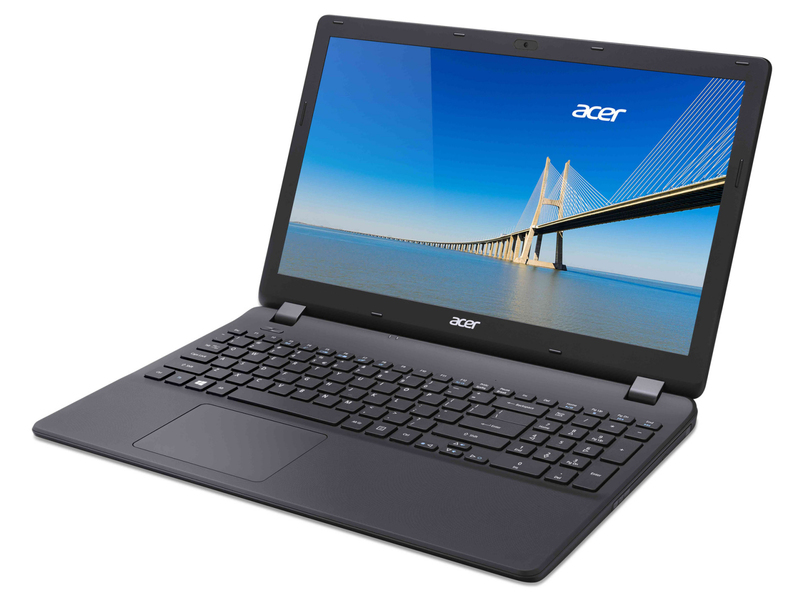 Acer has equipped the Extensa with a conventional 2.5-inch hard drive with a revolution speed of 5400 RPM and a capacity of 500 GB. The transfer rates are normal for a 5400 RPM model. Graphics output is rendered by Intel's HD Graphics (Braswell) GPU. It supports DirectX 12 and works at clock rates of up to 600 MHz. The new graphics core is significantly faster than its Bay Trail predecessor - albeit at a low level. This is not surprising, since the new GPU is based on the Broadwell architecture, while the predecessor used the Ivy Bridge architecture. The results are on par with AMD's Radeon R2 (Mullins/Beema) and Radeon R3 (Mullins/Beema) graphics cores in the 3DMark benchmarks. The GPU comes with an H.265 decoder. Thus it can reduce the load of the processor when playing such videos. The H.265 format will replace the wide-spread H.264 format in the coming years. It allows smaller files with the same image quality. The hardware accelerated playback of H.265 media has to be supported by the media player. Otherwise, videos will stutter. Under Windows 10, the included Film & TV app does so. When we played our test video (4k, H.265, 60 fps), the CPU load was just under 20%. Even if the SoC's graphics performance is significantly better than that of its predecessor, it is not sufficient for most games. Only a few games such as “Sims 4” achieve playable frame rates. Significantly more usable games can be found in the Window Store under Casual Games. The cooling requirements of the integrated SoC are low. As a result, the fan stands mostly still while idling and you can only hear the noise of the hard drive. When the HDD is replaced by an SSD the system would become silent. The fan does not even get loud during load. During the stress test we measured a noise level of 34.7 dB(A) - a very good value. Our Extensa behaves the same way during our stress test (Prime95 and FurMark run for at least one hour) whether on mains operation or on battery. The processor clocks at 1.44 GHz and the graphics core at 500 MHz. In view of the weak hardware, it is not surprising that the Extensa does not get particularly hot. The 40 degrees Celsius (~104 degrees Fahrenheit) level is only exceeded in a single measurement quadrant during the stress test. The temperatures are significantly lower at the other segments. (+) The average temperature for the upper side under maximal load is 23.9 °C / 75 F, compared to the average of 29.4 °C / 85 F for the devices in the class Office. (+) The maximum temperature on the upper side is 30.6 °C / 87 F, compared to the average of 33.9 °C / 93 F, ranging from 21.2 to 62.5 °C for the class Office. (+) The palmrests and touchpad are cooler than skin temperature with a maximum of 19.7 °C / 67.5 F and are therefore cool to the touch. (+) The average temperature of the palmrest area of similar devices was 28.2 °C / 82.8 F (+8.5 °C / 15.3 F). 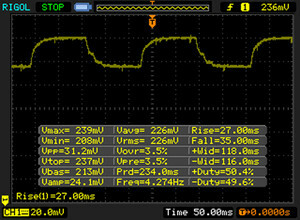 While idling, the energy demand of the Extensa is below 10 watts - this is a normal value for a ULV notebook in 15.6-inch format. Even under load, the power consumption does not get unexpectedly high. 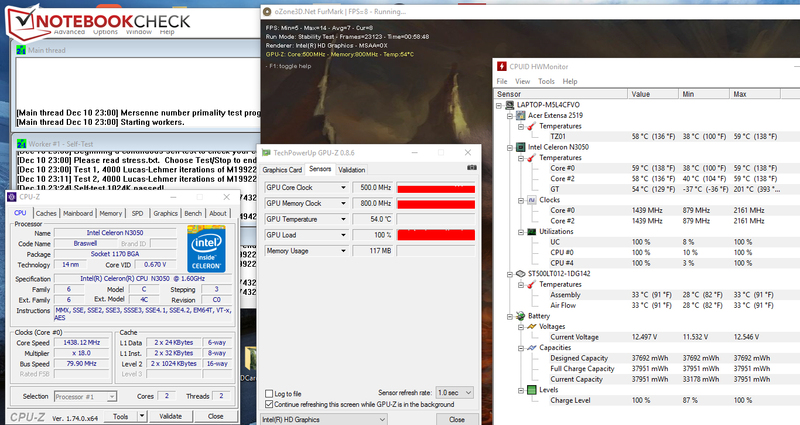 We recorded 15.4 watts during the stress test. The power consumption would be higher if CPU and GPU did not throttle. 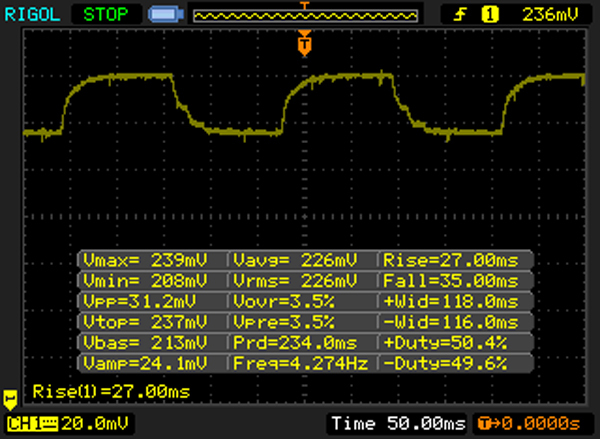 There is some room for improvement, since the power adapter is rated at 45 watts. With our realistic Wi-Fi test we simulate the load during web-surfing. 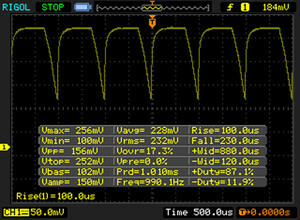 The "balanced" profile is active and the display brightness is set to about 150 cd/m². The Extensa lasts 5:40 h on a single charge. So, it is on par with its sibling. 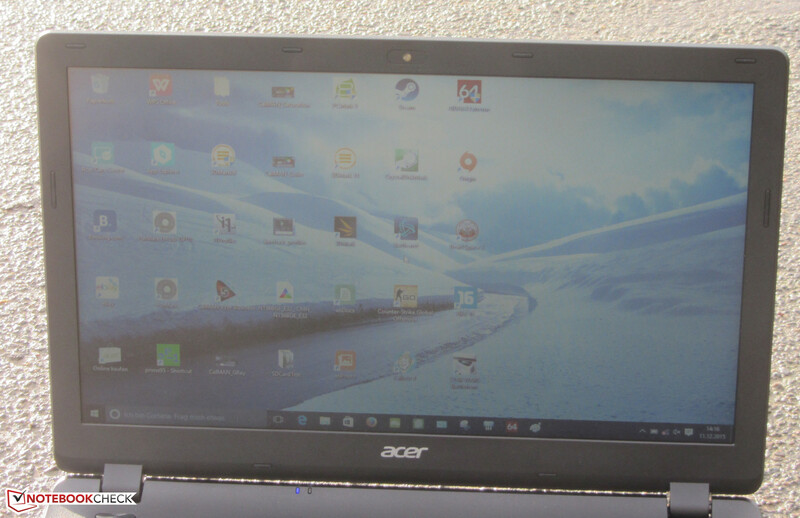 In review: Acer Extensa 2519-C7DC. Test model provided by CampusPoint. The CPU performance is sufficient for office and Internet applications. Thanks to the decoder integrated into the GPU, the Extensa can play all common video formats. Thereby, the computer always works quietly and hardly gets warm. Thanks to a 500 GB hard drive, the computer does not lack storage capacity. If you want to replace the hard drive with an SSD, you will have to open the case since the computer does not have a maintenance hatch. The integrated keyboard stands out positively and is suitable for prolific writers. The battery runtimes are good. In view of the price range, it is not surprising that the display will not win any awards. It has a low brightness, a low contrast and narrow viewing angles. 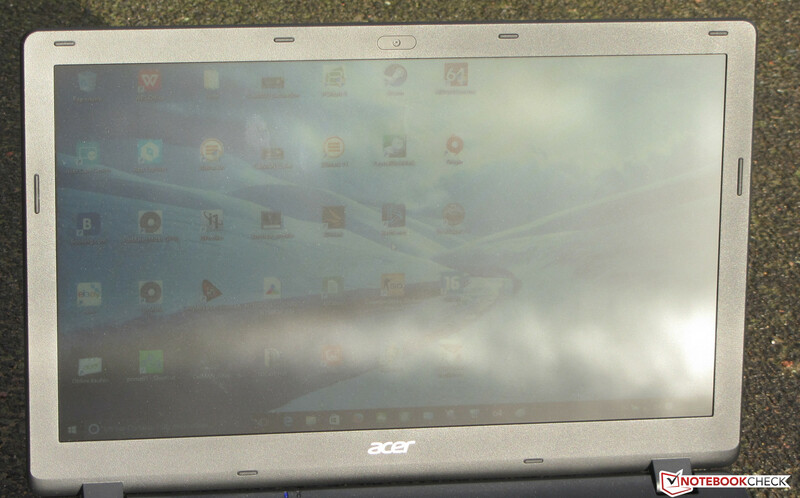 At least, Acer has incorporated a model with matte surface. As is usual with Acer, this low priced notebook comes with a 2-year warranty. Prospective buyers of the Extensa should be aware that they will only get a device for simple typing and Internet tasks and video playback. It stutters slightly when opening web sites, since the weak processor has to handle many involved elements.